Somewhat frustratingly, Instagram and Twitter only allow you to have one link in your bio at any point. I have found it quite annoying in the past when I have wanted to put, for example, a blog post link and a YouTube vlog link. I finally have a solution! Over the past month, I have been searching for the perfect answer and I have finally found 2 options that both allow you to have one link in your description but provide an interface that then allows multiple links to be shown. When I came across this site, I was gobsmacked and amazed. I didn't think something like this existed! What an incredible idea. I love that they use the tree idea to connote how clicking on one link, opens up the opportunity to many more. Signing up and designing your link is very simple. It pulls your username from Instagram to have as your link name but I actually have all my social media accounts the same so it worked perfectly for me. It was incredibly easy to put together the links and I could add an unlimited number. I added all of mine so that they were all in one place which I love. I love that everyone can now see my entire social media presence. While the interface is fairly simple, I actually really like how easy it is to read the links and highlight your selection. Given that my blog theme is green coloured, I was quite happy with the colour options but they are quite limited. You can change them slightly but the options are black, blue, pink, green and white, with two colours for each selection. One of the unique features that I didn't think I would utilise but have done, is the link tracking option that you can see for each link you have. While you can't see the daily count or locations, you can see the total number so you can visually see your progress. The whole process took all of a 5 minutes maximum and I really like how it presents my accounts. I generally love this site and option. My favourite thing is that the link looks really professional and personalised as it has the continuity from my social media presence itself. I use the free version and for me currently, this is perfectly adequate for my needs. I have looked at the paid option which costs $6 per month but has a bonus of many things. The main additions I would benefit the most from would be the option to see a day-by-day breakdown of link traffic and amazingly, the opportunity to time links to go live in-line with scheduled posts. I would love to be able to add links to posts as they go live! It's defintely an option I will consider in the future but overall I am very impressed! As a newly released website, it's clear that they are still working out some of the kinks but I defintely love the play on words for the name. Very clever! Once I created my account I struggled to understand what my link was and how I was supposed to add my social media links. Once I figured out I couldn't change the random link name that was given to me, I realised that I could add my personal links in the space provided. When I tried adding my sixth link, unfortunately I was stopped and told I had met my limit. It's slightly disappointing that you can only add 5 links, especially when I also wanted to include my business but nevertheless, it will probably suit most people's needs. As you can see from the picture, I did add an image of myself (as with linktree) but unfortunately the picture rotated 90 degrees. I tried two other pictures and both did the same thing so that is a little fault that needs sorting soon. 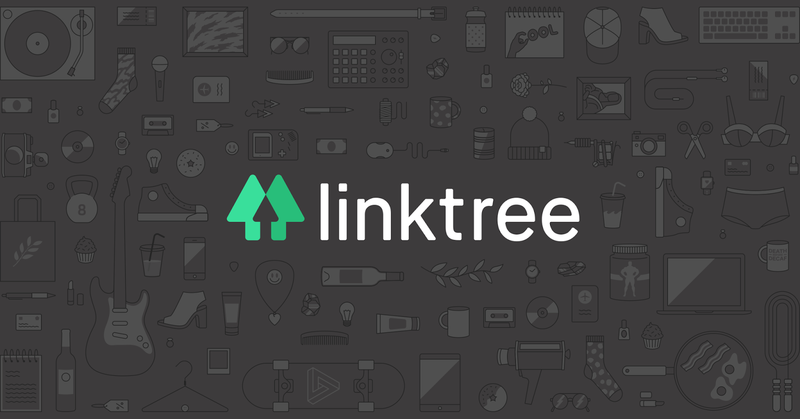 Similarly to linktree, you can track your links in terms of how many people visit each link and to be fair, both sites are fairly equal in terms of functionality of this feature. I do think the interface looks very clean and professional. I really like that the website recognised what each of the links were and put the social media logo on the side. This is optional and at the bottom of the screen there is a toggle switch to allow you to choose to utilise this or not. I personally think that makes it look much more qualified though so that people know what they are clicking on. Once again, you can't quite personalise your theme but there are 4 options on the site: white and black, then with or without rainbow text. I hate the black because it just looks ugly but I'm totally torn between the coloured text or not. It adds a little more fun to the interface but I can't decide if business collaboration opportunities will be lost because of it. I ended up switching between the two in all honesty, because while I loved the whiter background over the grey, I did prefer the black text. Once again, they have an option to pay for a more sophisticated link but as of right now, it is not available. Apparently it is coming soon but there is no date information given currently. Supposedly it will allow users to have unlimited links which is defintely something I would be interested in, along with a custom URL short code. I think these will defintely appeal to businesses and individuals who make money from their online presence. They also say, the professional option will have the footer removed so it will no longer say "Provided by LYNX" but I don't really care about that being there either way so I don't particularly thing it will be a major selling point. A quick point to mention is that it's only going to be $5 a month, making it slightly cheaper than the other option but it doesn't have quite as many features, especially the option of scheduled links which I love. Comparing the two, I defintely prefer linktree. I much prefer the interface, the opportunity to add an endless amount of links and quite simply the ease of the system. I would love to pay for the pro option to be able to utilise the scheduled links feature especially given that fact I have blog posts and YouTube vlogs which go live at a set time. I will be keeping my linktree link in my social media bio's but I will say that LYNX will probably improve their system soon so it's worth keeping an eye out for it in the coming months and years.